You can see my previous recaps here: 2015, 2016. Also, I’m sorry—this got long! GenCon 50! Whoa! In honor of it being the 50th, I read a Gary Gygax biography, a history of D&D book, a Sword & Sorcery book written by Gary Gygax, and I signed up for a Basic D&D game as well as a 5th edition D&D game. As always, what I want out of GenCon is to play as many role-playing games as possible, and meet authors I enjoy. I went in a lot looser this year than last year, for better or worse. In the end, I think this was my favorite GenCon so far, because of the people with whom I shared it. I might’ve learned a lesson, there. In the future, what I want out of GenCon will be much the same, but I think I’ll aim for the lighter schedule of this year, as well as the company of this year. The key to this year’s GenCon was playing all but one game with my friend Chris, several games also with my friend Todd, and, of course, GMing games for good people, as well. Chris and Todd are both great players, and my rapport with them helps take some of the pressure off me as I engage in a game. Plus, we have a good bit of fun playing together. I did find Margaret Weis at her booth, bought the next two books of hers (and Tracy Hickman’s) that are in my to-be-read list, and had her sign them. She’s a pleasure to talk to, and seemed to be in extra good spirits when I found her on Friday. From there I went straight to Jim Zub’s booth, bought the latest trade paperback of his comic Wayward, and had him sign it. I talked to him last year, and he suggested I pick up Wayward. It seemed to be a very Japanese-focused tale, and thus not my usual cup of tea—Skullkickers is what turned me on to him, and now he does D&D comics—but I think I was wrong. It is steeped in supernatural folklore. Jim Zub is a pleasant dude to chat with, too. It’s an absolute joy to meet an artist you admire, and have them be warm and kind in addition to talented. This proved a theme at GenCon. Jim’s booth presented a conundrum. Tracy Hickman was sharing the booth. I’d love to have his signature on the books he wrote with Margaret Weis. Is buying them from her booth, then going to his booth and not giving him money, a faux pas? I think it is. Instead of finding something to buy, I decided to put off the situation until next year. Perhaps I’ll buy his X-Treme Dungeon Mastery book to make up for it, huh? Last year, I got to play games written and GMed by Ray Otus. 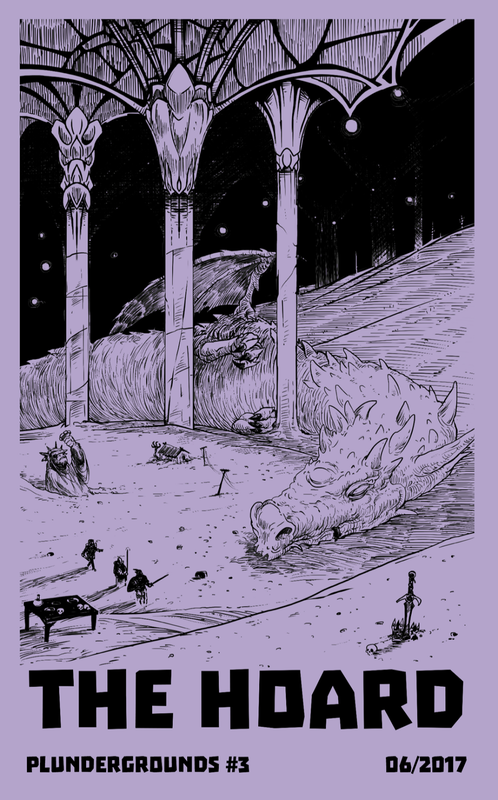 He now publishes a ‘zine regularly, called Plundergrounds, with great Dungeon World content. I got print copies of two of the four he’s published so far. I must’ve then allowed myself to get consumed by GMing a game for him for a change, because I didn’t ask him to sign either of them! I should have had him sign beneath this magnificent drawing of the dragon Salucidiar on the inside of Plundergrounds #3. (Cover posted below, though not the picture I had in mind. You’ll have to purchase a copy, digital or print, to see what I mean. :-) Damn. Well, hopefully I see him next year. For the fourth year in a row, I missed Patrick Rothfuss. It’s almost becoming a tradition. "Oh, yes, I’m a Patrick Rothfuss fan. No, I’m not going to get his signature at the con. Why? Well, it hasn’t happened for one reason or another for four years running now, it really seems a risk to break with tradition at this point. Unimaginable repercussions, init?" Hey, y’all, this is what GenCon is all about! Playing games together! Woo hoo! This time, we’re going in chronological order. What a way to start the con. This one will stick with me. Thinking about it right now, might chest tightens. Restless, however, is not a Jason Morningstar game. In fact, it’s not released yet. Designed by J. Walton, it uses a special set of cards to guide you through a zombie survival horror scenario. It’s 10AM Thursday morning. I didn’t sleep enough going into the con, but I’m determined to get things going immediately. I’m guzzling coffee, and getting excited. I’m not normally a survival horror guy, but, hey, it’s Jason Morningstar and GenCon is finally here. Let’s go! We start talking through our characters, discussing our bonds, as guided by the cards. Well, this is pretty neat. People are playing the zombies, essentially, and thus get to throw in complications to our plans. This is fun! We’re acting out scenes. It almost has a Fiasco feel as far as amount of scenes and active roleplay goes, thanks to both the players and the game. I started off playing Quentin, whose best friend left in the world was someone he served in the air force with, Grace. Then… well, let’s look at four lines I wrote in my notes. Grace: "Don’t be an idiot. Don’t be a hero." The game was so heavy, even though much of it took place in a shopping mall. There were some light moments, which we absolutely needed. It felt like one of the better The Walking Dead episodes—first season, when you’re still discovering what the rules are. Fiasco is a GMless game geared to creating what feels very much like a Coen Brothers screenplay, acted out at the table. I played it last year for the first time. This year, we played with Steve Segedy, the other partner at Bully Pulpit games! They were play-testing using cards instead of dice. Woo hoo! Play-testing is fun. The session mostly took place in a mall, too. Todd ran this jewelry store, Chris and I worked in it, Steve was a security guard, Randall was a who even knows but seemed to always be at the mall and maybe ran the place or maybe just seemed to? Things got crazy. Chris and I went to jail. Chris’s character thrived, mine killed himself. Yup. Coen Brothers movie. I love Fiasco. I’d like to get at least one game in every GenCon. Bulldogs! is for pulpy, gonzo sci-fi adventure, based on the Fate system. Honestly, I have been thinking of it as basically Futurama, and I think that’s pretty close. Todd, Chris, and I got into this one, and we were truly excited to bring our brand of hilarity to this game. Most of the pre-generated characters were based on Guardians of the Galaxy, which was actually cool, in a way. We ended up in a space shopping mall. (Malls were a theme of GenCon, I guess.) Todd settled into his plant-being character right away, and it was great. Unfortunately, the GM seemed to have a story she wanted to tell. In many cases, there was no getting around it. On top of that, I dislike Fate. I cannot get into that system at all, having now played all versions (sorta). I’m fairly sure my dog being with psychic powers could’ve solved every problem if I had pressed the issue, except for the "this is not what the GM wants the story to do" problem. Damn it, we just wanted to steal a shipment of ice cream, eat half of it, and sell the other half. That’s all! Adventures in Middle Earth is, as you might have guessed, about adventuring in Tolkien’s Middle Earth. It has Hobbits, Elves, Dwarves, and all of the lovely Lord of the Rings goodness you’d expect. It uses and adds to D&D 5e’s ruleset. This was my first ever experience with an actual D&D version! Adventures in Middle Earth is an attempt to port a game to 5e that was purpose-made for recreating Tolkien’s world called The One Ring. I have not played The One Ring, either, but it sounds like perhaps I should, as most reviewers say its mechanics lend itself to Tolkien better than 5e. Thinking about this session makes me absolutely giddy because I’m a Tolkien fan. More than that, though, it makes me giddy because I’m a Hobbit fan. Hobbits know what is best in life, and they live it. I’d like to come back a Hobbit, please, if that can be arranged. All you really need to know is that my Hobbit had dreams of visiting/experiencing things he had read in Mr. Bilbo’s and Mr. Frodo’s book, and the story ended with me in Beorn’s home, smoking his pipe with him. I basically played myself if I were thrown into Middle Earth, except skilled with a bow and sword and map reading. It sounds ridiculous, but I’ll not forget this session any time soon. … Hold on. I gotta get up and jump up and down for a little bit before I can continue. Woo hoo! Ah, the classics. We wanted to try our hand at an era of D&D that we missed. Until playing Adventures in Middle Earth the night before, I had never played actual D&D, instead often playing something inspired by D&D. So, I was excited! It was disappointing that our GM often talked down to us, and seemed to be adversary more than guide. It was also a table of 8 people, plus the GM, which I find to be too many. I had a hard time enjoying the game, and resorted to pulling out my phone a couple times, leading to holding up play. Total jerk move. I regret it. I should’ve just left the table, honestly. It would’ve been less disruptive for the rest of the party, who seemed to be mostly enjoying themselves. I wonder if old school gaming could still be a sort of fun, but I doubt I’ll seek it out again. I learn more and more what it is that I like, and that sort of game isn’t it. Another card-based game, The Quiet Year is about role-playing a village during a relatively uneventful year following an apocalyptic event. It is a year in which the village has the chance to build, grow, become more than a group of survivors. It can become a society. The game can be pretty deep, while taking place at a high level. You get to draw a map of your village as you play. Our GM was McGravin. He helped to organize Games on Demand this year, and was pleasant to chat with about games during the weekend besides. He admitted our game was a bit more "deliberate" than many. I still don’t know what I think of it, except that I think I want to try it again. Dungeon World is my favorite game, my go-to. It’s a game of cinematic fantasy adventure, of impossible monsters and treasureful dungeons. The game I played in on Saturday was with Bill White, the same GM who enjoyed our gonzo play last year. He was absolutely in form, and I learned a lot about GMing an exciting Dungeon World game from him during this game (more on that in the future). It was fast, hilarious, and action-packed. Chris’s cynical wizard deserved to die about 5 times but somehow only died (and came back) once. Good times. Lady Blackbird by John Harper is futuristic game about a noble woman running from an arranged marriage under an assumed name, and the crew smuggling her (somewhat unwittingly) away. The characters are pregenerated, but the story ends up different every time. I can now confirm, having played it twice, the story can be different every time. Last year, I was Naomi, the bodyguard for the noble in hiding. I didn’t know she was a noble (and would not have approved). This session, Chris was Naomi, and was well aware of her status. I was the Captain, enamored by Lady Blackbird, but unaware she is a noble betrothed to another (or two others?). I found playing the captain much easier, which perhaps says something about me—and I don’t know that it’s flattering. I tried hard not to dominate the game, but I don’t know if I succeeded. Captains talk a lot, right? I enjoyed this, but as a counterpoint, Chris felt hemmed in by the pre-generated character. He didn’t see more than one way to play Naomi. One thing about playing games like this in a game with a hard-stop at 2 hours is there’s not a lot of time to stop and discuss the subtlety. I struggled playing Naomi when I first played Lady Blackbird, too. Now that I grasp the game a bit better, I wonder if I’d find a different track. I’m not sure whether I would or wouldn’t. Maybe I can talk Chris into trying again next year, just to see what we think after another play through. I organized and acted as Game Master for two games of Dungeon World—Thursday and Saturday night, starting at 9p. Both were a ton of fun. The players were great in both games. I couldn’t ask for better, truly! Thursday night’s game featured a 4 fairly tired guys, and two fairly fresh guys. I was one of the tired folk. I see a lot I could’ve done better now to keep the energy up for all of us, but it was a fun game of snake worship and slaying. The adventuring party seemed to bond over their distaste for the creepy wizard Vitus (played by Ray Otus). In one of my favorite bits of flavor of the whole con, Vitus’s invisibility spell involved cracking a quail egg over the target’s head. Sunday is always Family Day. The kids put on some sort of costume (Zane: astronaut; Aubrey: Tiana from The Princess & the Frog), I throw on a cloak, and we go traipsing about playing games and watching cosplayers. We always see some Disney princesses, which the kids enjoy. This year, I threw on my Tim the Enchanter horns, which ended up popular. I had people asking to take pictures with me! See the picture below; this is ridiculous. I obviously was half-assing it. So, I’ll be buying a black robe—which I’ll tatter up a bit—a fake beard that matches decently, and a fake bone to tie around my neck to do it right next year. That said, thank you to those who wanted pictures with me, especially the impressive Viking Shield Maidens and their kids. Their makeup was enough to actually frighten my daughter, so the fact that they put up with my half-assed Tim was nice. The kids and I usually play and buy some Peaceable Kingdoms games, which held true this year, as well. Peaceable Kingdoms makes delightful co-op games. This year we bought "The Fairy Game" and "Race to the Treasure!". The Fairy Game skews a bit young for my kids, but what they really wanted was PK’s mermaid game, which is much too simple for them. Fairies are basically the next best thing. I thought Race to the Treasure! would keep them busy for a while, but they proceeded to dominate it from the get-go. Maybe we need to go straight to Pandemic. Unfortunately, we had to leave a bit early to make Zane’s soccer game. I think next year we might skip soccer. Soccer is basically every Sunday. 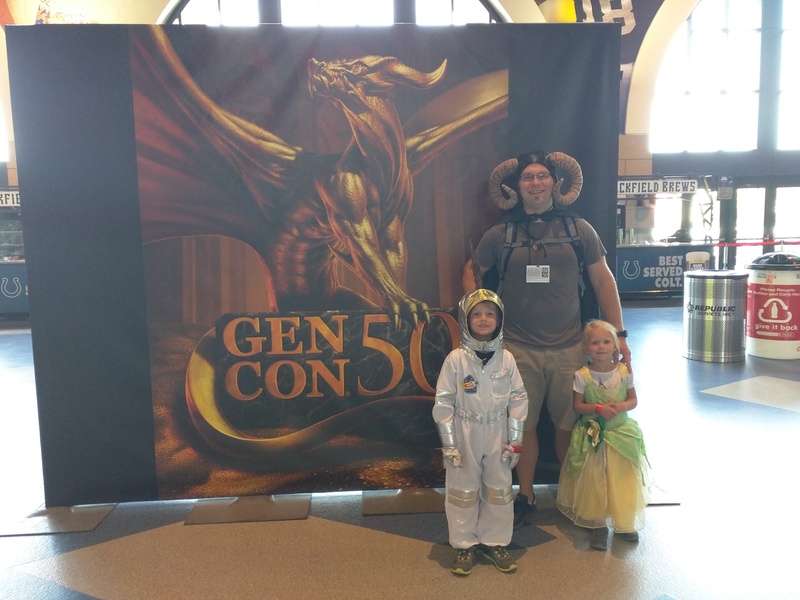 GenCon only happens once a year! It was a fantastic GenCon. I can’t wait for next year. Maybe at some point I’ll be able to just write, "I played these games, and met these authors. Here’s a pic of me and my kids. It was fun/not fun" and move on but this year is not that year. I’d advise you don’t place any bets on next year, either.